GRIP YOUR GEAR with LAZY-HANDS Thumbs-free grips for your iPhone, smartphone or cell phone. You can even put LAZY-HANDS on your cover or case. LAZY-HANDS will help you keep your hand steady while shooting photos or video. Grip it so you don’t drop it! 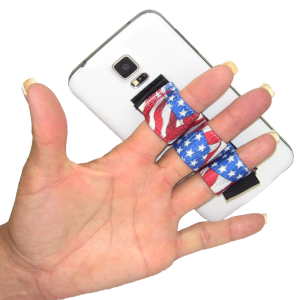 GRIP YOUR GEAR with LAZY-HANDS Thumbs-free grips for your Samsung Galaxy Note, Samsung Galaxy Mega, iPhone 6 Plus, LG G3, HTC One, Nokia Lumia and other similar super-sized phones and phablets. Do you struggle holding your new extra-large phone that you just love but worry about dropping it? Get a LAZY-HANDS Grip and take your worries away! You’ll never find a more secure-feeling grip that is extremely effective for your needs. The original and finest quality phone grip available! Thumbs-Free®, ergonomic, extremely comfortable and very secure hold. Helps to prevent fatigue, hand cramps, pinky deformation and dropping. Allows for one-hand use and extends thumb reach. Applies to your mobile gear or its case with an acrylic adhesive hook and loop design that is easily removable. Grip can be used as a kickstand by bunching up bottom end and re-applying to Velcro. Aids in keeping hand still while taking selfies and videos. Perfect survival gear for Pokemon Go enthusiasts. 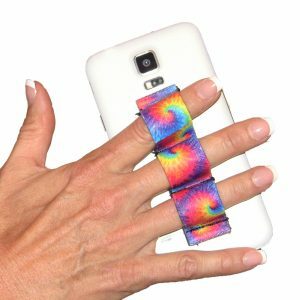 Wear your phone grip on the back of your hand like a ring and suddenly you have a free hand to grab your beverage. Helpful for arthritis sufferers, stroke patients, and those living with Multiple Sclerosis, Parkinson’s Disease and other nerve-related injuries. Great for hand therapy patients. Includes 1 3-loop thumbs-free grip and 1 adhesive-backed loop sheet. Small — fits children and very-small-hands sizes for most young adults, women and men. Fits Most — fits hands sizes for most young adults, women and men. XL — best fit for extra-large-sized hands.